Thailand has recalled its ambassador from Cambodia over its appointment of ousted Thai leader Thaksin Shinawatra as a government economic adviser. Thai Prime Minister Abhisit Vejjajiva said the step was "the first diplomatic retaliation measure" to express the concern of the Thai people. Mr Thaksin was ousted by the military in 2006. A court convicted him in absentia of corruption last year. Recent border skirmishes have also strained Thai-Cambodian relations. Phnom Penh announced on Wednesday that Mr Thaksin would serve as a special adviser both to the government and to Prime Minister Hun Sen.
State television said Cambodia would refuse to extradite the tycoon because it considered him a victim of political persecution. A government spokesman told the BBC that Cambodia valued Mr Thaksin's leadership qualities and business experience and that he would be an asset to the country. Mr Abhisit accused Cambodia of interfering in Thailand's internal affairs, and a foreign ministry official said bilateral co-operation agreements would be reviewed. "Last night's announcement by the Cambodian government harmed the Thai justice system and really affected Thai public sentiment," Mr Abhisit said. 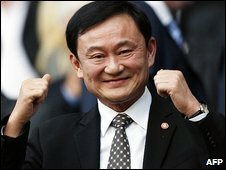 Mr Thaksin - who has lived mostly overseas since he was ousted - remains a divisive figure in Thailand. Since the coup, both supporters and opponents of the former telecommunications mogul have repeatedly taken to the streets of Bangkok in large protests, some of which have turned violent. Thailand's relationship with Cambodia has also become more volatile in recent months. Troops have clashed sporadically around the border temple of Preah Vihear, which both claim as their territory.